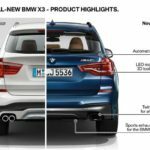 The new BMW X3 – Technical Highlights (06/2017). 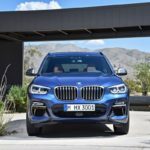 The BMW X3 launched the mid-size Sports Activity Vehicle segment when it arrived on the scene in 2003. 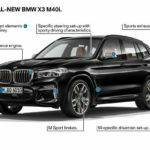 More than 1.5 million units of the X3 have since rolled off the assembly line and now the third-generation model is ready to take over the baton. Eye-catching design ensures distinctive looks and highlights the car’s dynamic mission statement and familiar X character. 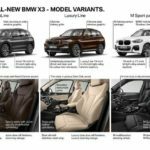 Customers can choose from three model lines – xLine, Luxury Line and M Sport – and the BMW Individual range of products to align the inside and outside of the new BMW X3 even more precisely with their personal tastes. 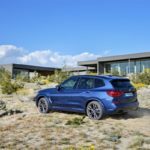 The range-topping BMW X3 M40i will be the first M Performance Automobile in this model series. Carefully honed chassis, including reduced unsprung mass and sophisticated axle kinematics, elevates sporty handling to another new level. 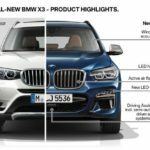 From the launch of the new model (or shortly afterwards), the engine line-up will feature three petrol and two diesel engine variants with outputs from 135 kW to 265 kW (fuel consumption combined: 8.4 – 5.0 l/100 km; CO2 emissions combined: 193 – 132 g/km)*. All models come with the eight-speed Steptronic transmission as standard. Weight reduced by up to 55 kilograms from the predecessor model thanks to intelligent lightweight construction; class-leading aerodynamics (Cd = 0.29). State-of-the-art operating system, with optional gesture control and Intelligent Voice Assistant. Owners can operate functions including the optional auxiliary heating using the optional BMW Display Key. 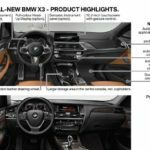 BMW CoPilot: Options such as the latest generation of Active Cruise Control and the Driving Assistant Plus safety package including Steering and lane control assistant, Lane Change Assistant (est. from December 2017) and Lane keeping assistant with side collision protection provide extensive scope for (semi-)automated driving. 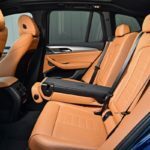 The full range of latest-generation BMW Connected functions are available, providing seamless connectivity between owners, their cars and the outside world. 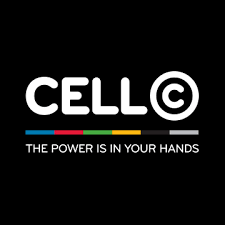 Available in South Africa in the fourth quarter of 2017 (November 2017).